The online sports betting industry has exploded in the past decade with a proliferation of betting websites to handle all the action, but the simple fact that all of these transactions take place through the internet raises some serious concerns with just how safe and secure this wealth of information remains. Running your own business in today’s fast-paced world without the right business tools is not an easy thing to do. When it comes to successfully running an independent sports bookmaking business without the right Pay Per Head service running things can quickly become just plain hard. 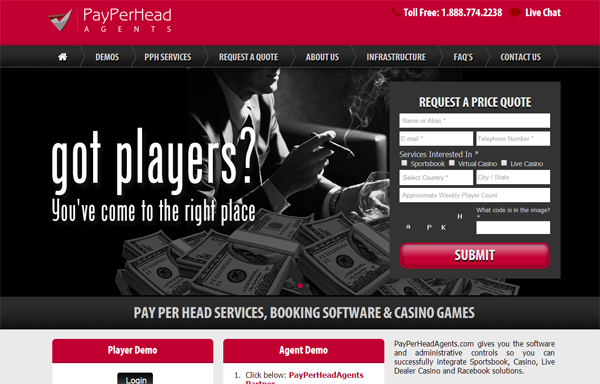 PayPerHeadAgents.com gives you the software and administrative controls so you can successfully integrate Sportsbook, Casino, Live Dealer Casino and Racebook solutions. Premierperhead.com has become a leader in the Pay Per Head industry faster than most. This is because of their attention to detail and decades of experience on both sides of the business. Their "by bookies, for bookies" approach gives agents the piece of mind that their business will run smooth 24/7. Additionally, PremierPerHead offers American customer service as well as live in-game wagering for every game, every day. The guys over at Premier take your business seriously. Bwin.Party quarterly revenues have fallen to their lowest in three years. Chief executive Norbert Teufelberger said revenues were unlikely to start improving until the second half of the year, but was confident the group would hit targets outlined in March. “We guided the market that we expected revenues will decline this year by up to 10 per cent versus 2012,” he said. “Despite the first quarter revenue performance, we remain comfortable with our guidance,” he added. A little rain Saturday helped guarantee record traffic numbers to the Gambling911.com website for our extensive Kentucky Derby betting coverage. Saturday’s traffic numbers typically feature more of a lean towards sports. Even with the NBA Playoffs kicking off Saturday, there was still a substantial audience for gambling news outside of the sports betting realm, much of this due to breaking news regarding World Sports Exchange’s closure and continuing coverage of Legends Sports legal issues. While poker and gambling news dominated Thursday’s readership traffic at Gambling911.com, the NBA Playoffs are fast approaching and G911 is revving up its coverage with some decent results already starting to trickle in. Gambling911.com continued to receive plenty of readership traffic April 15 for the latest news on Full Tilt Poker former head Ray Bitar, updates on last week’s Legends Sports bust in the United States and our extensive coverage on Bitcoin’s crazy rollercoaster ride. Gambling911.com enjoyed great success with the 2013 NCAA Tournament, ranking well in search right up to the Final. Case in point, we ranked number 4 on Google for “2013 NCAA Championship Point Spread: Michigan vs. Louisville” but still received tons of traffic. With the March Madness Sweet 16 and Elite 8 concluded, Gambling911.com has seen some more exceptional search results. For industry professionals, be sure to check out our Marketing section regularly here and if you wish to contact us, please do so here. We are available 24/7. It is one of the most pivotal betting periods of the year with March Madness tipping off Thursday. Leading up to Thursday’s first set of games, there was certainly plenty of traffic coming to the G911 site via search. With the turmoil at IGT, some of that company’s best talent have decided to walk away. Jenny Woo here with your Gambling911.com Trending Report for Monday June 14, 2010, which covers the past weekend traffic. As always you can follow us on Facebook.com. Get all the latest news updates and find out what stories are trending on Gambling911.com. Get upcoming story alerts as well. We have a number of announcements up now. Don't miss them.